1/10 Ounce American Eagle Gold Coin. 50 x Brand new, uncirculated 2019 gold Eagles. 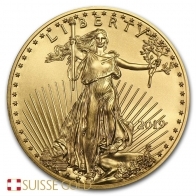 Each 1/10 Oz gold American Eagle contains 99.9% pure investment grade gold bullion. The American Eagle gold coin depicts an image of Lady Liberty walking on the front with a torch in one hand some branches in the other. The reverse of the coin features an image of two Bald Eagles building a nest for their eggs. 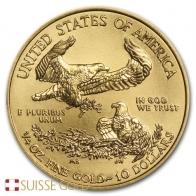 The American Eagle gold coin was initially released in 1986 by the United States Mint. 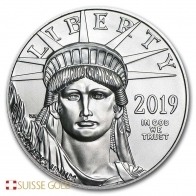 The coin is available in 1/10 Oz, 1/4 oz, 1/2 oz and 1 oz sizes. In addition to gold, the American Eagle series is also available in silver and platinum. 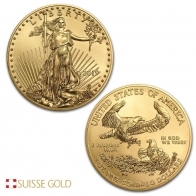 The US Mint also produces the famous gold St. Gauden and American Buffalo gold coins. The 1/10 Oz Gold American Eagle has a face value of $5 USD. Please contact us to sell 1/10 Ounce gold Eagles.